The New York Times bestselling investigation into the sexual, economic, and emotional lives of women is “an informative and thought-provoking book for anyone—not just the single ladies—who want to gain a greater understanding of this pivotal moment in the history of the United States” (The New York Times Book Review). But over the course of her vast research and more than a hundred interviews with academics and social scientists and prominent single women, Traister discovered a startling truth: the phenomenon of the single woman in America is not a new one. And historically, when women were given options beyond early heterosexual marriage, the results were massive social change—temperance, abolition, secondary education, and more. Today, only twenty percent of Americans are married by age twenty-nine, compared to nearly sixty percent in 1960. 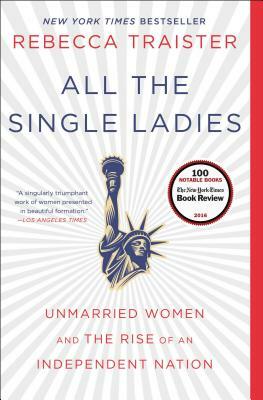 “An informative and thought-provoking book for anyone—not just single ladies” (The New York Times Book Review), All the Single Ladies is a remarkable portrait of contemporary American life and how we got here, through the lens of the unmarried American woman. Covering class, race, sexual orientation, and filled with vivid anecdotes from fascinating contemporary and historical figures, “we’re better off reading Rebecca Traister on women, politics, and America than pretty much anyone else” (The Boston Globe).